I had some ricotta cheese leftover from making wild mushroom ravioli (recipe here) and lemon ricotta muffins (recipe here). But I didn’t really have enough to make anything else, so I made Ricotta and Tomato on Toast. This is a lovely and fresh summer snack. Toast any bread that you like (ie. crusty bread or rye). Spread the ricotta on the toast and top it with thin tomato slices, a pinch of coarse salt, freshly cracked black pepper, and a drizzle of extra virgin olive oil. Infused olive oils are great for this, ie. garlic, herb, or lemon. Use your favourite variety of tomato. 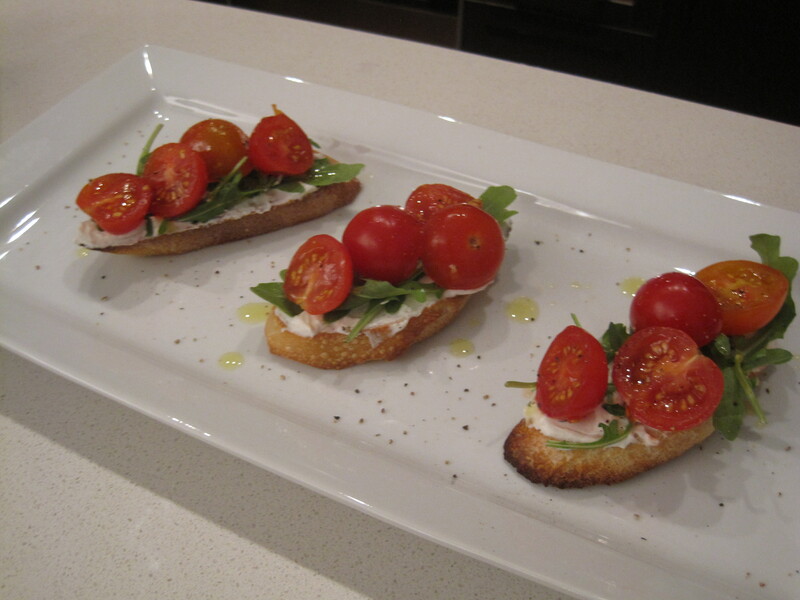 After John’s housewarming party, I made ricotta and tomato crostini to use up a variety of our leftovers. Ricotta and tomato crostini are beautiful and easy to make for any party. Top toasted baguette slices (baked in a preheated 350 degrees F oven for about 7 minutes) with a thin layer of ricotta cheese, baby arugula or rocket, and halved cherry tomatoes (try combining red and yellow cherry tomatoes). Top with coarse sea salt, freshly cracked black pepper, a light drizzle of high quality extra virgin olive oil, and some fresh basil for garnish (if desired).